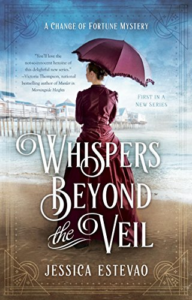 Jessica Estevao has launched a terrific new series with Whispers Beyond the Veil. Set in 1898, it has everything you could want in a mystery: rich characters, superb settings, and of course, murder. First and foremost, Jessica gives a shout-out to her blog mates over at Wicked Cozy Authors. They include Liz Mugavero/Cate Conte, Sherry Harris, J.A. Hennrikus/Julianne Holmes, Barbara Ross, and Edith Maxwell/Tace Baker/Maddie Day. What a team! We talk about research into the past, including the Harmon Museum, the Lily Dale Assembly, and her neighbor Daniel Blaney, who literally wrote the book on Old Orchard’s history. She also wants to give a shout-out to Sisters in Crime for all they do to help writers, both new and established. Finally, Jessica was kind enough to share her own personal story of a time when trusting her instincts — and a voice in her ear — saved her life. I have to use this as an opportunity to recommend Gavin de Becker’s The Gift of Fear. I can’t recommend it often enough. Very few books can save your life; this is one of them. Read it. And if you’d prefer to read the interview, as always, it’s below. Enjoy! Laura Brennan: My guest today is an accomplished, award-winning novelist with a brand new series. As Jessie Crockett, she has the delightful Sugar Grove cozy mysteries, feature mayhem and maple syrup in equal doses. As Jessica Estevao, she has just launched a new series, set in 1898, and featuring a heroine with a dark past and an otherworldly gift. Jessica, thank you for joining me. Jessica Estevao: Thanks for having me. LB: I want to talk to you about your writing career. You have both a cozy series, a couple of other books, and now a new historical series. But first I want to ask, why mysteries? JE: I love mysteries. When I was a small child, my father used to travel on business and when he was gone, my mother would let me stay up and watch Agatha Christie mystery movies on television with her, which was of course a hugely special treat. So that was one aspect of it I suppose. But I think one of the reasons also was that the first chapter book that I remember reading was The Bobbsey Twins at the Seashore. And I just remember feeling so accomplished at reading a chapter book instead of a picture book. And I think that sense of delight associated with mysteries has remained my entire life. As an author, one of the things that I truly love about writing in the mystery genre is that the challenge is to conceal as well as to reveal. And it’s really delightful to use that scaffolding to tell a story and to challenge yourself to tell both of those stories, what’s real and what’s misdirection. LB: Now, your first book was Live Free or Die, and you took home a Daphne for that right away. LB: You took the world by storm. So how did that book happen? JE: It kind of came as a response to a semi-tragedy here in my village. My postmistress in the village had been here for years when I started to write that book and then she retired. And I missed her terribly. And it seemed that the only way to get back the right sort of postmistress was to make my own. But in reality, we have had a couple of truly lovely postmistress and since then, but I like to think that sending out that energy to the universe got them for us. LB: It got you back your perfect postmistress. JE: Yes. The postmistress in a very small village really is a wonderful character, to be at the heart of the town and to set the tone and hours did it beautifully. And I just really wanted to honor that and recapture that in writing. LB: You wrote that first book, you really did take the mystery community by storm. But you went into a new series. LB: The Sugar Grove cozy mysteries. One of the things that makes them so special is the humor. All of your fans, and you do have legions, they remark on how well and how much you make them laugh. JE: You know, I didn’t actually set out to write anything funny. I think that it took me by surprise that it came out funny and it took me by surprise at how many people found them to be amusing. You never know with humor if people will think that it’s tickling their funnybone or they will think it’s really silly and ridiculous, or they just won’t, they will feel that way about it at all. And so I hadn’t set out to write funny, so I don’t, I guess is not hard because I didn’t know I was doing it. It just came out that way. In both cases, and Live Free and the Sugar Grove books, that was just the sound of the main character. I think both of those books have a main character who looks at the world in a way that’s a little bit quirky maybe compared to the average person and so that’s what makes it funny, the way that they respond to the situations in which they find themselves. I think this is how my mind works. LB: So murder, really, to some extent, murder is just about the structure your plot. But comedy is hard, and yet that’s the thing that came so naturally to you. JE: Yeah, I think it’s a worldview. And it’s a little bit hard to reconcile humor with murder. I started with a little bit as I was working on live free, is it right to make a lighthearted tone to something so tragic? And as I was trying to decide whether or not that was even morally correct, I just had to say to myself, you know, my job is to tell the best story. I can only bring myself to the page and when I’m facing something in life that is in so wonderful, I tend to bring some levity to it to endure it. And I think many many people do that. And so that makes it legitimate. LB: In your current novel, which is the first in a series, Whispers Beyond The Veil, that does take a different tone with the mystery. JE: It does, yes. It didn’t feel the same to me. It didn’t feel the same to me at all. And I don’t really know why the different books sound different, but the people have their own voice. Different characters that appear in my books have their own voices. And Ruby just doesn’t have the same life, she doesn’t have the same style to mother to make characters. LB: So Ruby is — it’s an historical mystery, it takes place in 1898, and she certainly comfortable in this time. She finds herself very quickly in a very new situation, in a very uncomfortable situation for her. So that’s what launches — no spoilers here, that’s what launches the story. How did you come up with Ruby’s character? JE: I think she showed up pretty fully fleshed. I felt like I just know her. I feel like that’s the case with Ruby, I feel like she just sort of said, pour yourself a cup of coffee, I’ve got something tell you. I knew that I wanted to write a book set in Old Orchard Beach, historically in Old Orchard Beach, before Ruby showed up. That I knew. And as I spent a couple of summers there becoming clearer and clearer that that was something I wanted to try, and getting more and more sure of what time period I wanted to turn my hand to, she started to show up. Once I decided on when, she volunteered to tell the story. LB: So, how much research? How much research did you do into the time period? JE: You know, actually, that was a great deal of fun so I can’t say for sure how much, because I was keeping track. It wasn’t onerous. I did end up having quite a number of really enjoyable research jaunts. There is an historical museum right in Old Orchard, the Harmon Museum. It is possible, even though it is quite small, to get lost in there for many days. They just have such wonderful material, photographs and clippings and actual physical items and really knowledgeable staff. I also interviewed the town historian, he lives right down the street for my summer place that’s there so he was a neighbor and his name is Dan Blaney and he was a font of information about early years in the town. One of the resources I particularly have found useful and really enjoyed was a reproduction of a Sears and Roebuck’s catalog from 1897 in order to see what sorts of things would be available for everyday household items and what they would cost. One of the things I also really enjoyed was the reproduction of a Fanny Farmer Cookbook that had come out in, I think, ’96? But maybe don’t quote me on that. Before Ruby, but not much before. So I wanted to see what they would have been serving. That was one of the other things, I have gardened for years so I have a good understanding of what the temperature is like and when and when you plant things and when things are, it’s too hot or we’ve had frost or whatever. And to try and work out what a hotel dining room could have been serving before they had the types of food preservation methods that we have now with refrigeration and refrigerating trucks and things like that, as those things were just coming into being, to be able to have fruits and vegetables in June on the coast of Maine. What would they have had? LB: Now, another thing you had to research was, this was the age of Spiritualism. LB: And that plays a big part in the novel. LB: So, how did you come to that is being one of the pillars of the story? JE: — in the face of such large and luxurious establishments. Having it be the sort of hotel that would have spiritualists made practical sense. And also, I just really enjoy this elements and books. I did go and research that as well. I’ve done a couple of research trips that involve that. There’s a spiritualist enclave in Etna, Maine, and I went up for an event there that was a Victorian séance evening. I attended with my mother and we arrived at the spiritualist camp. So these camp situations are really the New England concept of a camp which is that there are cottages and houses and indoor plumbing and a dining hall. LB: My kind of camp. JE: Yeah, it’s not really camp. And the people are very friendly and very welcoming. And people that were the mediums for the evening, the psychics and the mediums for the evening, were dressed in period costumes and so are some of the attendees, which was really fun as well. And they had table set up all around the hall and they had numbers on the tables and they had all of the mediums pull a number from a basket or bowl or something, they couldn’t see them. And they each went to the table with the number that was on their paper that they had pulled. And then they had all of the people who incentive to attend also reach into a bowl and pull a number, so it was very random assignment to where you sat and with whom. I ended up at a table with a gentleman who was a spirit artist, so he would start to draw what he was seeing as he was doing his channeling. And then he would give you the artwork to take home. It was really interesting, it was soothing in a way, it put you at your ease to watch as he was sketching away with colored pencils and just kind of chatting with you as he did it. It was really engrossing. And it wasn’t, even though the atmosphere was conducive to feeling a little Gothic and spooky, this gentleman wasn’t that way at all. It was really very soothing and pleasant. I enjoyed myself immensely. And he went around and did this with everybody who was seated, I think there were eight of us or so at the table. And he was enormous fun. LB: Well, I think that’s got to be so much fun. I mean it’s really fun to see your book in the bookstore but come on, Victorian séance? That was awesome. JE: It was. I have to say, it’s a really great gig. This has been a tremendous amount of fun to research in every aspect from the clothing to the furniture to the manner of speaking to the food to the psychics. Even a tarot cards. I went this summer, as research for the second Ruby book, I went to the spiritualist enclave in Lily Dale, New York for six days. It’s the largest ongoing Victorian era founded spiritualist community in the world. And they have mediums everywhere, up and down the streets, you can stop and make an appointment. It’s an amazing place to go. They had platform readings, they had healing circles, they do Reiki, all sorts of different medium disciplines, from people who did sort of paintings and drawings, so channeled art, kind of spirit drawings, to clairaudience and healing. It was astonishing. It was a really interesting place to go and it gave me a real foundation for having a better sense of how Ruby would have done her job, and whether or not I was interpreting that authentically. And it was gratifying to find that, yes, indeed I was. LB: Tell me a little bit about Ruby’s gift. JE: So Ruby is clairaudient. And that’s one of the things that people have not always heard so much about as being clairvoyant. So clairaudience is the ability to hear things that other people aren’t hearing, as opposed to seeing things that other people aren’t seeing like clairvoyance would be. Ruby is clairaudient, and she has been dismissive a bit of this gift because she’s been raised to be a con artist. That’s her job, that’s her history. And so she doesn’t really want to fall for her own con, sort of, by believing in this clairaudience. She doesn’t realize that it’s something that she’s been gifted through her mother’s family line. She was raised with her father, her mother’s dead and she doesn’t know anything about that side of her family. And when she discovers that it’s not a con, she has to reconcile that with her worldview. And also figure out how to use it to her advantage. LB: Ruby is clairaudient. And I understand that that wasn’t just by accident? JE: That’s true. I am a big believer in all sorts of ways of receiving information in the world. And I’m not a big believer in accepting everything that happens as truth, but when it feels right for you that I think it’s something to listen to. Yeah, I have had a few clairaudient experiences that I simply could not explain away. And I feel like I owe my life to it in at least one instance. I wanted to give that to Ruby. I felt that was something I could speak genuinely about for her character. When I was a new driver, I was 16, my parents were like any other parents and they were so pleased to have an extra driver in the house to run some of the errands that were no fun to run. And I ended up taking my younger sister to a middle school dance. And we had a driveway that was shaped like a lowercase letter h and the lower half circle portion of the driveway was someplace I never turned into. I always parked my car at the top of the straight portion of the h. And on my way home from dropping my sister off, I was coming up towards the first driveway into that half circle portion, and I heard this voice in my left ear saying, ‘Take the first driveway.’ And I thought, well that’s weird. And I ignored it. And then I heard it a lot louder and it said, ‘Take the first driveway.’ And it was quite assertive about it. So I said, well, okay. And I took the first driveway. I had no idea why I did what it said, but I pulled in. And as I pulled in, I noticed this car swerve off the road and it slammed into a tree in the yard of the house across the street from my house. This enormous plume of earth shot up into the air and I felt like I couldn’t hear anything else at that point, like both of my ears were stoppered. And I turned up the straight part of the driveway. I went into the house, and my parents were both standing in the kitchen with anxious looks on their faces and they said what happened? And I said, I think there’s been an accident. And my father and visiting friend went running down to the end of the driveway and there were enormous skidmarks right in front of the second driveway. In my lane. And all of the passengers in the car that has slammed into the tree, the driver and all the passengers died. If I had taken the second driveway, it looked as though I would’ve been in a head-on collision. JE: And as soon as my, I had gotten into the house, the phone started to ring. And the woman who I babysat for called and she said, “Is Jessie okay? I just had this feeling something happened to her.” My mother reassured her and hung up and the phone rang again. It was a mother of a friend of mine. And she said, “I just had this bad feeling that something’s happened to Jessie. She all right?” And my mother reassured her and she hung up in the phone rang again, and it was the pastor of our church. And he said, “I just feel like something’s happened to Jessie, is she all right?” And if it weren’t for that first driveway, I wouldn’t be. Every now and again, I get a voice like that. And sometimes it’s when something is a little, it would be awkward, like don’t say that, don’t make that remark, it turned out it would have hurt someone’s feelings based on something I just didn’t know. Or we were in, my husband and I were in a car accident several years ago. And I heard a voice, same one, I was sitting back with my closed, it had been a long day, and I felt the brakes start to go and I heard the voice say, ‘Keep your eyes closed.’ And I did. And I was very glad that I hadn’t seen what happened. So when I hear it, I listen. And I don’t hear it frequently and I am not able to do what Ruby is able to do. I’m not able to ask and get some help. I’m sort of at the mercy of if it shows up, but I’m always grateful and I’ve benefited enormously on two occasions from it showing up. That’s why Ruby is clairaudient. LB: Oh, that’s great. I didn’t want to push, because it’s personal, but I appreciate that you told it on the podcast. That’s terrific. JE: I think it’s something that not everyone would believe, but that doesn’t mean I don’t believe it. And it doesn’t mean it’s not valuable. I really believe, especially for women, and saying listen to the voices that you hear especially when they’re trying to tell you to stay out of trouble. If you hear a voice inside, your intuition, I think more people are helped by that than hurt by it. It’s easy to dismiss and I think it’s worth saying. LB: No, I think it’s dangerous to dismiss and I’m gonna use this as an opportunity to plug The Gift of Fear, by Gavin de Becker. JE: Yes! Yes. I would say that the voice that I hear never makes me fearful. And it usually doesn’t tell me anything I want to hear. It’s not like wishful thinking that I feel like is being reinforced by something outside myself, it’s never anything cool like that. It doesn’t say things like, ‘buy that lottery ticket.’ It says things that don’t make any sense like, ‘Take that driveway.’ And then you end up not being dead, which is of course better than the lottery ticket in the end. But it never says anything great like that. But it is very useful, and I hope anyone who hears something like that will feel empowered to listen to themselves. LB: Absolutely. I think that intuition is vastly overlooked and underappreciated, the real thing and it can really keep you, it can keep you safe. I’m delighted that yours and that voice kept you safe. JE: So am I. I’m very appreciative. And it’s something always said my kids: we don’t know where we’re getting all the information that we’re getting. We don’t know for sure how we know what we know. So just because it’s not as conventional doesn’t mean you should dismiss it. LB: No, absolutely. You also have a lot of support as a writer. You have created your own coterie of other women cozy writers. Can you tell me a little bit about Wicked Cozy Authors? JE: Oh, I’d be pleased to do that. The Wicked Cozy Authors, we’ve been together as blog mates, it was three years in May. We were all just starting out. We all had the same agent, we were all members of the New England chapter of Sisters in Crime, and we all knew each other from attending events and conferences and things like that over the years. I don’t know who suggested teaming up at first, but four of us, the first year we did it, went away together on retreat. We had a great time. We talked about what it would be like to be launching a new series, and could get the book done and what would marketing look like, and all the things that you think about is your starting out. And by the next year there were two more people eager to go on retreat with us and one of them had the great idea to start a blog. That would be Sherry Harris. A few weeks later, maybe three weeks later, we had a blog up and running and we’ve been going ever since. And it’s really, I feel really really blessed. Because it’s a great business, writing is a great business, but in reality it’s also very lonely if you don’t have anyone to bounce any of it off of. Because most people don’t live with other writers. Most people don’t know a lot of other writers in their neighborhood or their everyday existence, and to have what really works out to be colleagues and coworkers and teammates. Even if what you’re doing is contacting them mostly through email and Skype and conversations on your blog, it’s so valuable, it’s so nourishing. It just made the whole journey so much more of a pleasure. LB: What is next for you? JE: I just recently turned in the second book in the Change of Fortune series, so there will be another Ruby book. JE: Yes. And I’m working on another project at the moment that I, I’ve got to keep it under my hat a little bit. LB: Ah! Another mystery. You’re leaving us with another mystery. LB: Well, thank you so much, Jessica, for joining me today. JE: It’s really been a pleasure. thank you so much for having me.